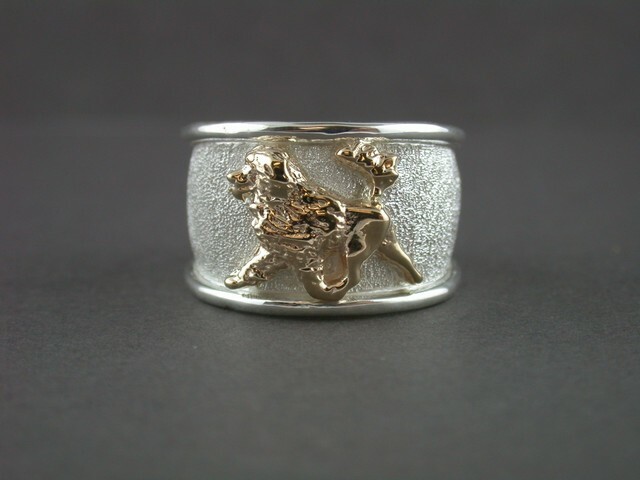 STERLING SILVER CUFF WITH 14K DOG. WIDTH 1 INCH. 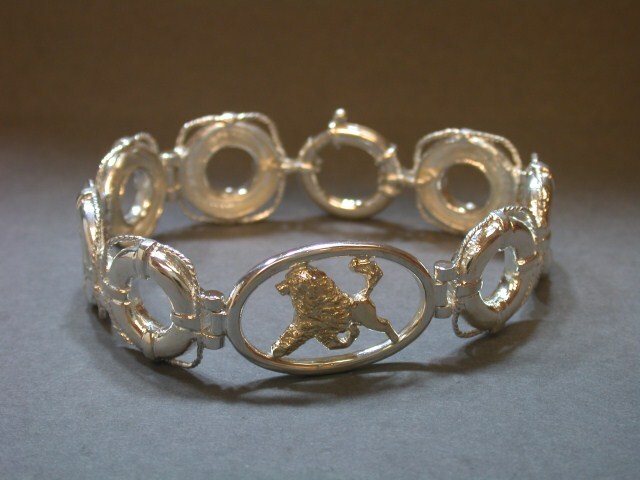 14k and steling silver combination bracelet, size 7 1/2"
Sterling silver with 14K dog. 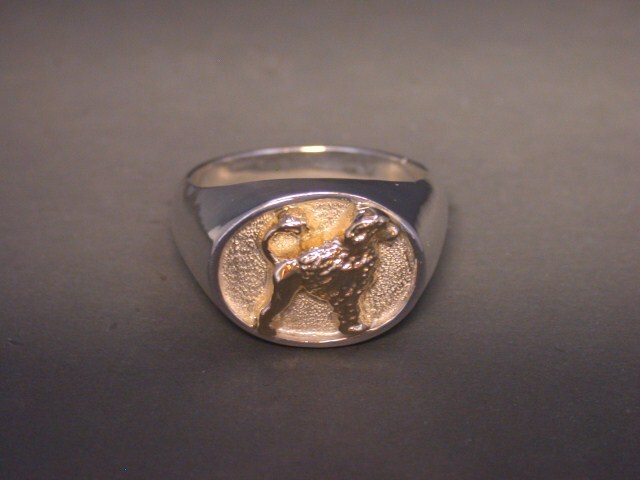 STERLING SILVER WITH 14K DOG. 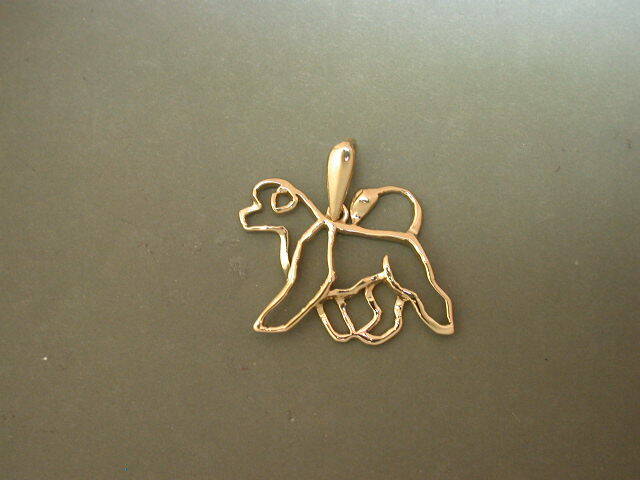 SIZE 7 1/2"
STERLING SILVER BRACELET WITH 14K GOLD DOG. SIZE 8 1/2"
BLUE TOPAZ WITH ROSE GOLD HEAD STUDY AND RUBIES AND DIAMONDS, SIZE 6 3/8"
Sterling silver post earrings, 1 1/4" X 5/8"
14K Pendant with yellow rose and white gold, 1 3/4" x 1 3/8"
14k Pendant, 1 7/8" x 1 1/16"
14K Frame with silver dog and 1.10 cts.t.w. amethyst stone, 1 3/8" x 2"
Sterling silver Pendant with a 11mm aquamarine stone. 1 1/2" x 1 1/2"
14k Frame Pendant w silver dog & mother of Pearl with Amethyst, 1" x 7/8"
Sterling silver pendant with cz stones, 1 7/8" X 1 3/8"
STERLING SILVER WITH 14K HEAD STUDY AND CZ, 1 3/4" X 1 5/8"
14K WHITE GOLD WITH YELLOW GOLD HEAD AND .66 CT. T.W. DIAMONDS. 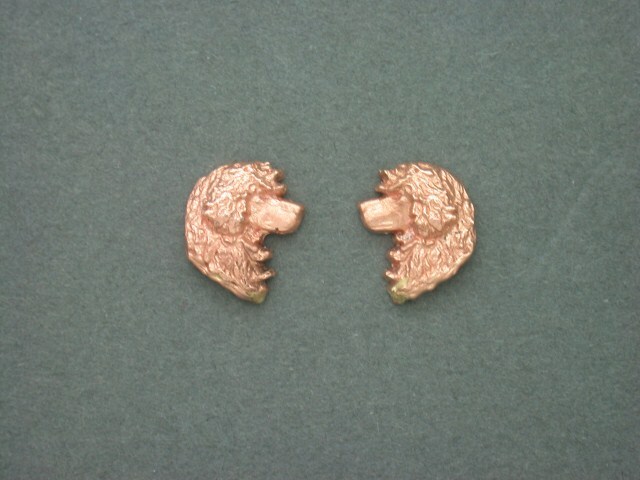 SIZE 1 3/8" X 1. 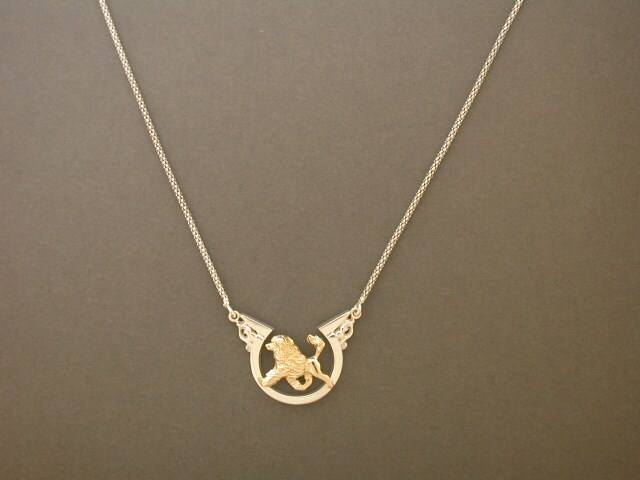 14k Frame Pendant 1 9/16" x 1 9/16"
14k Frame Pendant 1 1/4" x 11/16"
STERLING SILVER WITH 14K HEAD STUDY. 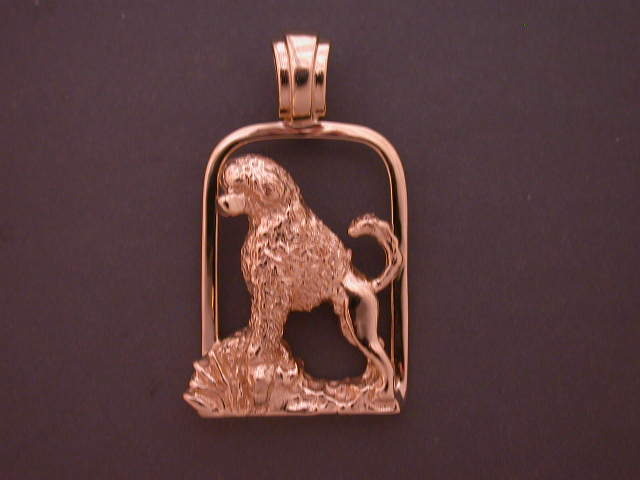 1 1/4" X 1 1/4"
14k dog with sterling silver frame with enamel finish. 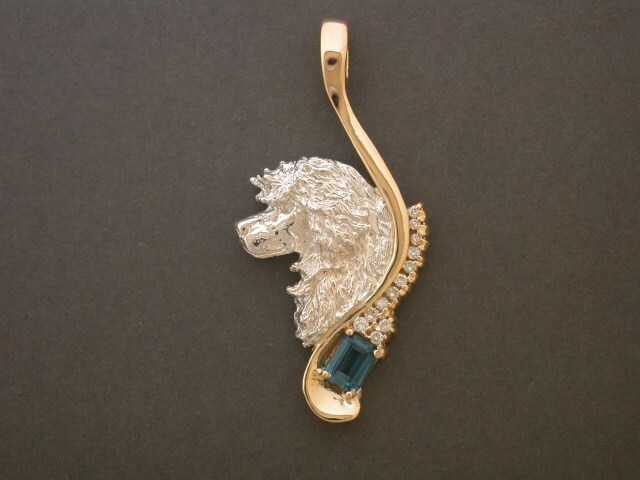 14k PENDANT WITH 1.32 CTS. T.W. 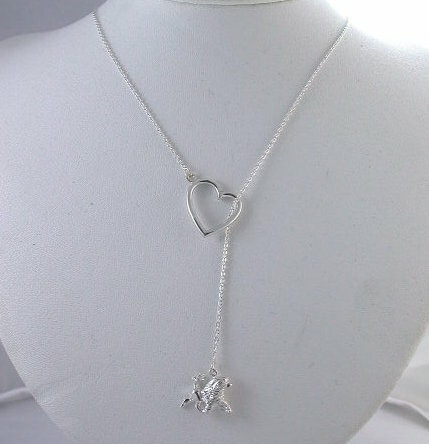 DIAMONDS, 1 /18" X 2"
14K Pendant in yellow and white gold set with 1.03cts. t.w. diamonds and .56 ct. Sapphire, 2 x 1 5/8"
STERLING SILVER PENDANT, 1 5/8" X 15/16"
STERLING SILVER PENDANT WITH ENAMEL FINISHED. SIZE 2 1/8" X 1 5/8"
14K Yellow Gold Pendant with Pear .90cts. and .22cts t.w. diamonds 1 1/2"x 1 1/4"
STERLING SILVER PENDANT WITH 8 MM CITRINE. 2 1/2" X 2 7/8"
Sterling Silver Frame Pendant, 1 5/8" x 7/16"
14k Frame Pendant, 7/8" x 5/8"
Sterling silver necklace with 14k dog. 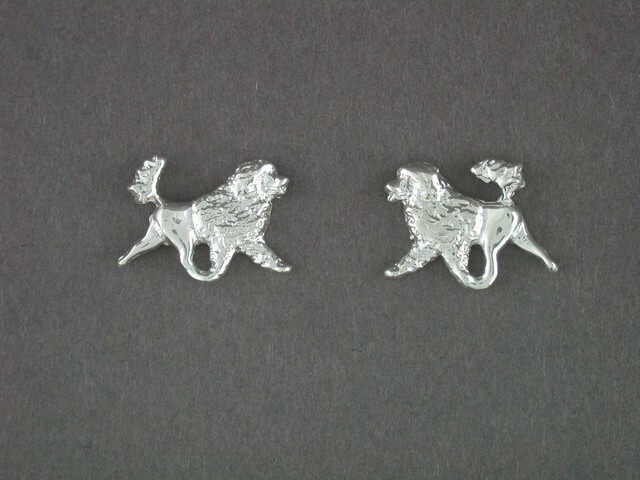 14k Earrings, 1/3" x 1/2"
14K Rose Earrings studs, 1/2" X 3/16"
14k Earrings, 3/8" x 3/8"
14k Earrings, 7/16" x 5/16"
14k Pendant, 1 1/2" x 1"
14k 3 Dimensional Pendant, 3/4" x 5/8"
14k Pendant 7/8" x 1"
14k Pendant, 1 3/16" x 1 1/8"
14k Pendant 7/8" x 1 1/4"
14k Pendant, 3/4" x 1"
14k Yellow Gold Pendant, 7/16" x 3/4"
14k Pendant 5/8" x 7/8"
Portuguese Water Dog F.B. 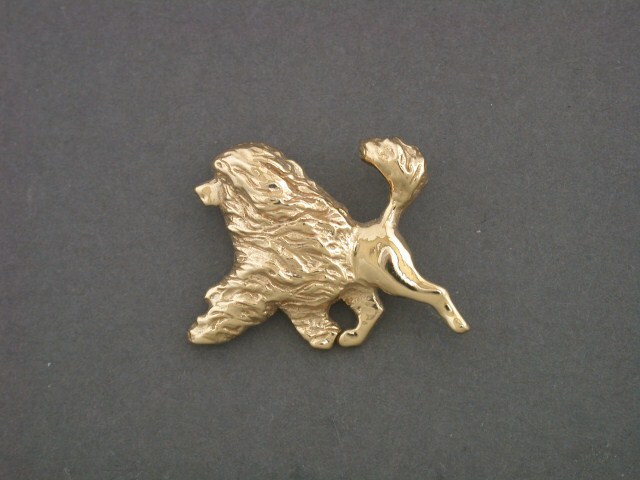 Lion Cut Med. 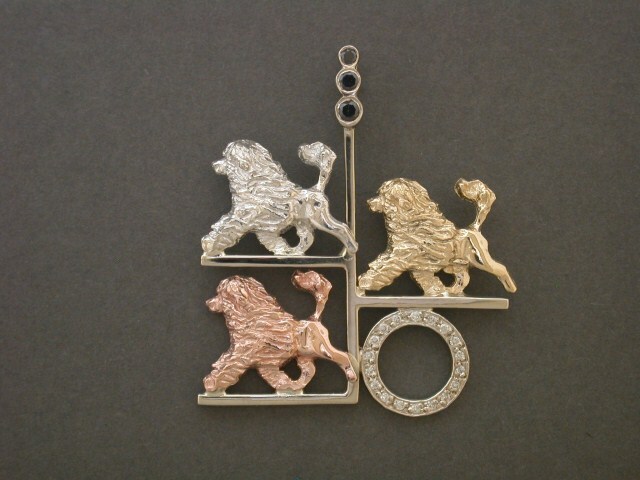 14k Pendant 3/4" x 1 1/8"
14k Broach, 1 1/8" x 1"
14 Pendant, 1 3/8" x 1 1/8"
14k Pendant 1/2" x 5/8"
14k Broach, 1 1/8" x 15/16"
14k Pendant, 1/2" x 5/8"
14k Pendant, 3/4" x 7/8"
14k Broach, 1 1/4" x 1 3/8"
14k Pendant, 7/8" x 7/8"
STERLING SILVER 2 1/8" X 1 1/2"
14k Pendant, 15/16" x 3/4"
STERLING SILVER, 1 3/4" x 1 1/4"
14k Pendant, 7/8" x 3/4"
Sterling Silver Pendant, 7/8" x 3/4"
14k Pendant, 9/16" x 7/16"
14k Pendant 7/8" x 5/8"
14k Pendant, 5/8" X 1/2"
14k Pendant, 1" x 7/8"
Sterling Silver Pendant, 3/4" x 1"
Sterling Silver Pendant 7/8" x 1"
Sterling silver band with 14k yellow dog, size 7 1/2"
14K yellow gold ring, size 8 1/2"
STERLING SILVER RING. 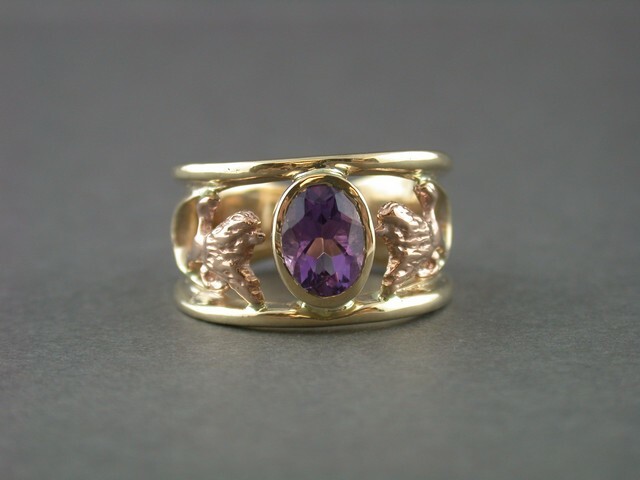 SIZE 5 1/2"
14K yellow gold with 14k rose gold dogs and 1.5 cts amethyst, size 7 1/2"
14K RING. 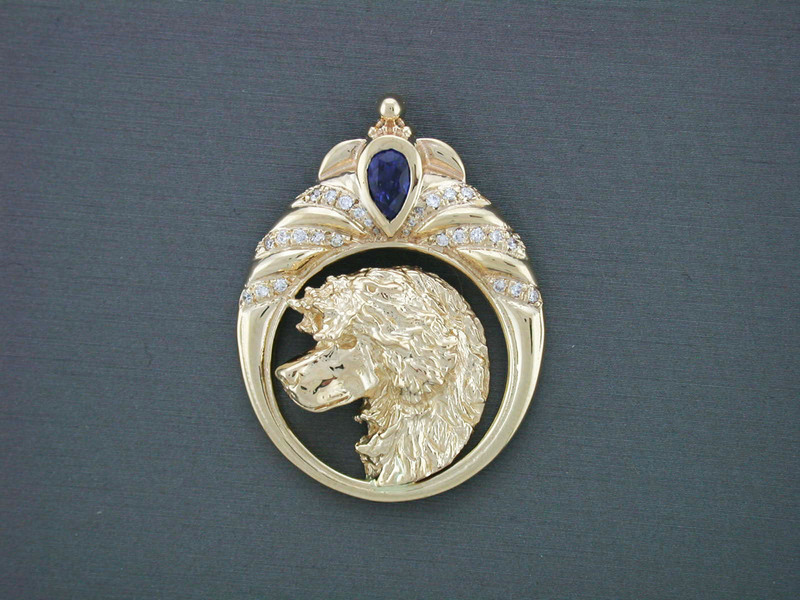 SIZE 6 1/2"
14K PENDANT W SAPPHIRE 2 X 1 5/8"